We’ve been buying a lot of tomatoes at the farmer’s market recently because we’ve found a farm stand with good prices on heirloom tomatoes. And the tomatoes are really good. So I keep looking for new things to do with them. The spaghetti al pomodoro was good. As was the tomato soup. But I’m always looking for something new to try. Angela originally had this at the Zuni Cafe (I was too interested in my Caesar salad to try it). She had liked it so I thought I would try it again. We always have left over bread and we had the tomatoes so there wasn’t much else that was needed. Plus the recipe seemed easy. And it was. It’s just barely cooked tomatoes with bread to thicken. It took me a bit longer than I expected simply because the prep work was a bit longer than I expected (particularly the blanching of the tomatoes). But it wasn’t a lot of work. I liked the soup a lot (although I never did get around to eating the leftovers). Angela didn’t like the barely cooked flavoring of the tomatoes. The bread gives it a consistency similar to cream of wheat which I liked. It’d be good if you were having teeth problems. I plan to make it with roasted tomatoes in the future to see if Angela might like it better. Blanch half the tomatoes in boiling water for 30 seconds. Rinse them under cool water and peel and core them. Cut them into 1/2″ chunks. Core the remaining tomatoes and cut them into 1/2″ chunks. Make sure to capture all juices. Sweat the onions over medium-low heat in a large sauce pan with 1/4 cup olive oil and a pinch of salt until softened, about 5 to 10 minutes. 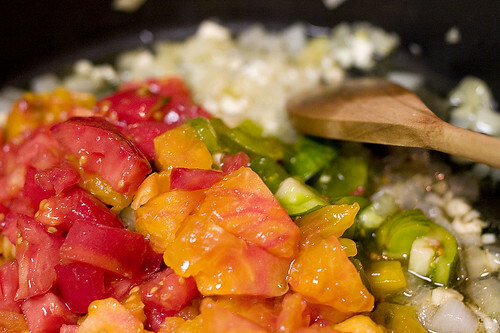 Add the garlic and sweat for 2 to 3 minutes more, or until the garlic is softened. 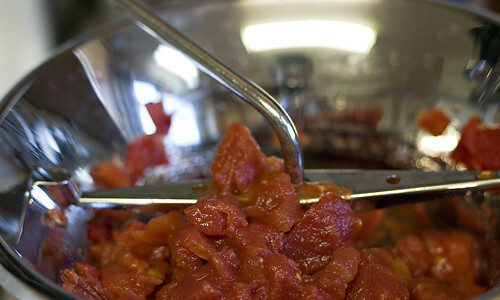 Add the tomatoes and juices to the sauce pan. Remove the leaves from the basil stems. Add the basil stems to the sauce. Cook over medium heat until the tomatoes just start to break up. Taste for seasoning and add salt or sugar if necessary. 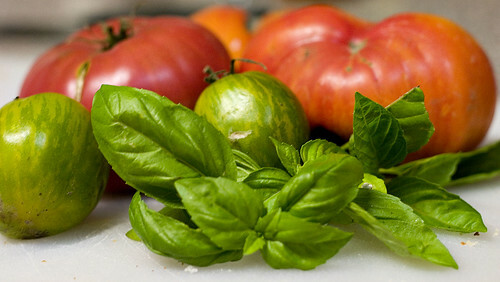 Remove the basil steams and add the torn basil leaves. Tear the bread into pieces and add to the soup. Stir to combine. Bring to a simmer then remove from the heat. Cover and let sit for 15 minutes. Serve the soup with black pepper and a drizzle of olive oil. For my birthday, we got two live Dungeness crabs. Trying not to be wasteful, I put the crab shells in the freezer with the plan on doing something with them. It took me about two months, but I finally found the time and inclination to actually use them. So, I decided on crab bisque. I did, however, have a little bit of a problem finding a recipe for it. Most recipes seem to think you’ve got some live or at least uncooked crabs that you’re planning to make into soup. To me, this is more than a bit wasteful. Why use rather expensive uncooked crabs when you can instead use left-overs (plus that’s what I had). A lot of the recipes (including Julia Child’s) were really for lobster bisque with brief instructions on how to modify it for crab or shrimp. Which really isn’t that big of a deal but it’s easier for me if I’m making the intended recipe (particularly for something I’ve never made before). In defense of the internet, a quick Google search did lead me to an appropriate recipe. And the recipe worked out pretty well. I did need to cook the stock for a bit longer than the recipe specified; it was pretty weak when I tasted it after the proscribed cooking time. I may have also added too much cayenne pepper (or at least that’s what she-who-must-be-obeyed said). Now, I had never had crab bisque before so it’s hard to compare it’s quality. It tasted pretty good to me but it would probably work better as a first course than as a whole meal (of course we opted for it as a meal as I’m too lazy to make more than one labor intensive thing at a time). The consistency was also a little different as I opted not to strain it so there were chunks of rice and shallots and whatnot in it. It still was pretty tasty. And, in my defense, the soup looked like that in real life. How do you go about making pictures of crab bisque look appetizing? In a large soup pot, melt the butter over medium heat. 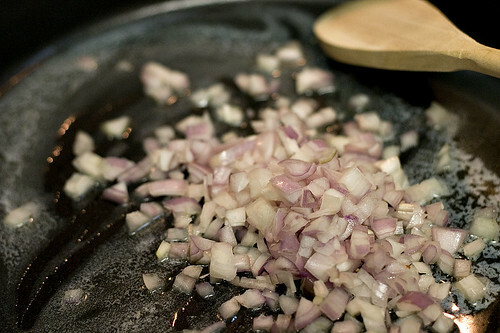 Add the shallots and cook until they are softened, about 5 minutes. Add the vermouth, crab stock, white rice, and tomato paste and bring to a boil. Reduce heat to a simmer and cook for 25 minutes or until the rice is fully cooked. Remove from the heat. Add the crab meat to the soup. Working in batches, purée the soup to the desired consistency. Return the soup to the pot. Add the heavy cream and bring to a simmer. Cook until the soup has thickened slightly. Season with salt and cayenne pepper to taste. 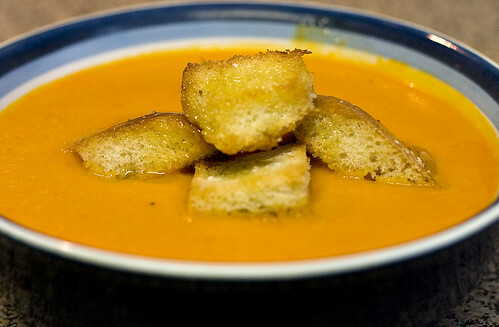 Adapted from Simply Recipes (in turn adapted from Williams-Sonoma Mastering Soups and Stews). In a stock pot, place the crab shells and add water until it comes 1 inch above the top of the shells. Place the stock pot over medium-high heat and bring to a simmer. Reduce the heat and maintain a slow simmer for 1 hour. Skim the surface of the stock to remove scum. 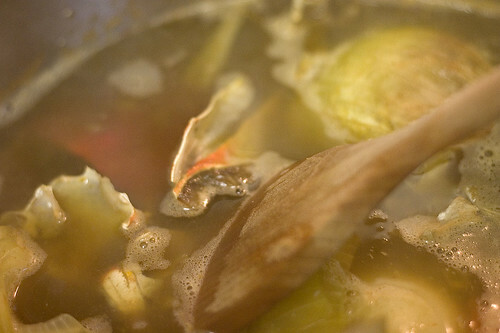 After the stock stops to produce scum, add the vermouth, onion, carrot, celery, and boquet garni. Continue to simmer for 1 hour more. Drain the stock through a cheese-cloth lined strainer. Taste the stock for strength. If it’s not strong enough, boil the stock until it reaches the desired strength. Season the stock with salt to taste. Makes 2-3 quarts of stock. Most weeks at the farmer’s market, I buy tomatoes when they’re in season (which is most of the year around here; eating seasonally has a whole different meaning in Southern California). 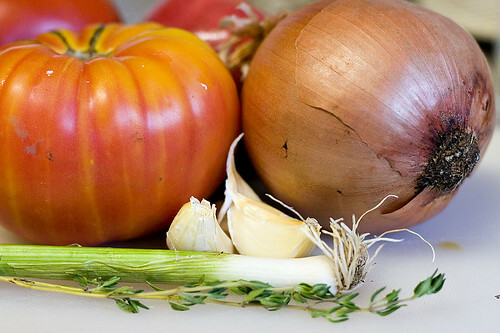 Recently, I’ve seen not only the standard Roma and Beefsteak tomatoes, but also a variety of heirloom tomatoes. Normally, I buy the Romas and make a tomato sauce out of them. This week, though, the heirlooms were calling my name. It didn’t hurt that one stand was selling them for only $2.00 per pound. Our farmer’s market is on Sunday and, sadly, two of the smaller tomatoes didn’t make it until Thursday. At that point, it became imperative to actually eat them and not allow them to slowly explode on our counter top. I had met Angela for lunch on Thursday so a lighter and simpler dinner was in order. I had originally thought about making pappa al pomodoro but the leftover bread was too far gone to resuscitate (and there wasn’t much left). Instead, I decided to just make a simple tomato soup. This isn’t the first tomato soup I’ve made but, despite some similar ingredients, this is rather different. 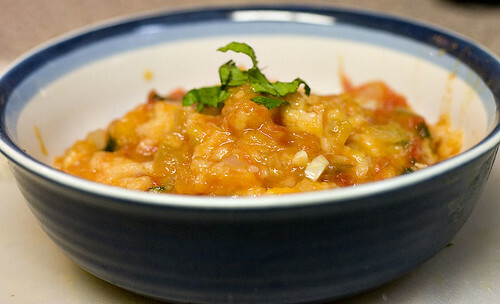 This is a lot simple and is much more centered around the flavor of ripe tomatoes. Last night, the simple flavors worked very well. We also discovered that Angela and I prefer different levels of salt in this dish: her more, me less. This is a bit unusual as I usually like my food a little more well seasoned than she does. So make sure you taste for seasoning before serving. There’s no requirement to use heirloom tomatoes in this soup but I can’t help to think that it fits the spirit of the dish better. But, really, whatever is fresh and ripe. In a large sauce pan, melt 1 tbsp butter with the olive oil. Add the onions and leeks and a large pinch of salt and sweat until they’re softened, about 10 minutes. Do not allow them to brown. Add the garlic and sweat for 2 minutes more. 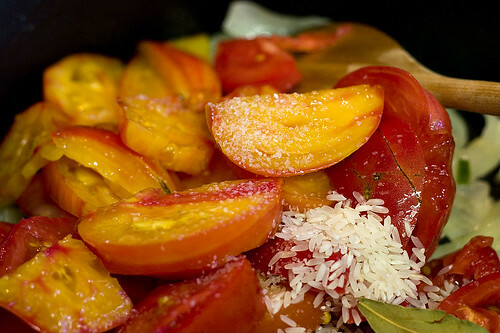 Add the tomatoes, rice, bay leaf, thyme, and a large pinch of salt. Cook over medium heat until the tomatoes begin to fall apart, about 10 minutes. Add the water and remaining 1 tbsp butter. Simmer for 10 more minutes. Purée in a blender for 1 minute in batches. Push the soup through a medium strainer. Taste for seasoning and reheat if needed. Serve topped with crutons and a drizzle of olive oil. I work in a building that is, at times, fairly well air conditioned (read: cold). It’s also significantly closer to the beach then where I live (which means it’s cooler). So, on Monday, I was feeling a cold at work (I swear I walked between buildings and also was cold but it could’ve been that it’s heavily in shadows) and was trying to figure out what to make for dinner (the refrigerator is mostly bare and we had some tomatoes left over from last week). In early afternoon, I called Angela and said that it was a bit cooler and would she mind having tomato bisque for dinner. Turns out, when I got home that there were two complications: it was most definitely not cold (it wasn’t quite hot but it was definitely not on the cold side of the scale) and Angela thought I meant this soup (not that I really had any particular recipe in mind). Well, when she-who-must-be-obeyed tells me that she expects one thing for dinner, if I’m smart (like that’ll happen regularly), I make what she wants. And so I did. This recipe actually comes from one of my favorite cookbooks from one of my favorite restaurants. I went to college (er, technically I went to “institute”) in Rochester, NY and the area right around the school was a chain-restaurant wasteland. Every once in awhile, we’d consider it special enough (or when parents visited and were willing to pay), we’d venture downtown and go to Dinosaur BBQ. Now, not being from the south (Maryland never seceded y’all), I have no idea how this compares to the “real thing” (Angela, while being from Florida, is really from “Southern Long Island”). I consider it to be very good and that’s good enough for me (I’m getting hungry just thinking about the pulled pork; I may make my bastardized crock pot version this weekend). Right before I graduated from college, I realized there were several things I would miss from Rochester (outside of the people). Towards the top of the list was Dinosaur BBQ, so while shopping at a bookstore I noticed they had a cookbook and I bought it. Now, I don’t have a backyard and, hence, no grill or other way to smoke meat but surprisingly, there are plenty of recipes for indoors (or that can be adapted for indoors use, such as the above mentioned pulled pork). Also, uniquely among barbeque restaurants (or so I’ve heard), they gave away their recipe for their sauce (of course, I’ve not made it from scratch; some grocery stores sell it and it’s indistinguishable from the original). The thing that’s amazed me about the cookbook is that the recipes work. They’re clearly written and they work well. Outside of Julia Child, there are very few recipes that have worked as well for me as the ones in this cookbook. So I highly recommend you buy it if assuming (and this is a pretty easy assumption to make) you don’t own it. And there are no pictures of the soup because they were pretty unattractive. Preheat the oven to 375°F. Cut the tops off the bulbs of garlic, exposing the tops of the individual garlic cloves. Sprinkle with salt and pepper and drizzle with olive oil. Wrap the garlic bulbs in aluminum foil and roast in the oven for 45 to 60 minutes or until they are softened. When the garlic bulbs are finished cooking, squeeze out the garlic into a bowl and then, using a fork, make a paste of the garlic. Prepare the tomatoes by either running them through a food mill fitted with a disk with large wholes or, skin them, dice them, and crush them with a potato masher. 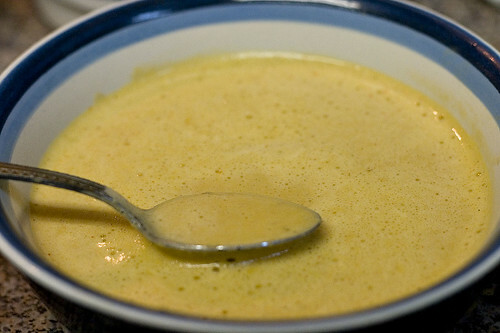 In a soup pot, melt 2 tbsp of butter and 2 tbsp of olive oil over medium-high heat. Add the onion and add a pinch of salt and pepper. Cook until softened. Add the minced garlic and cook for 1 more minute. Whisk in the flour and cook for 1 minute. Then, whisk in the chicken stock. Add the roasted garlic, the tomatoes, and the bay leaf. Bring to a boil, cover, reduce heat to low, and simmer for 15 minutes. Uncover and add the heavy cream, the parmesan cheese, thyme, and lemon juice. Season generously with Tabasco sauce. Remove from heat. Puree the soup either with an immersion blender or, in batches, in a food processor or blender. 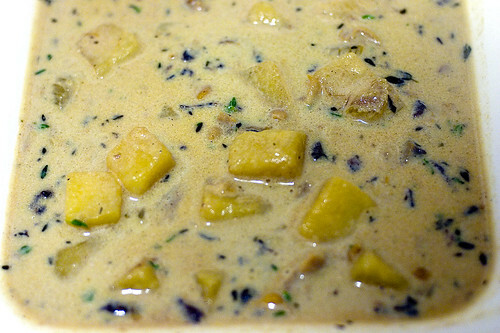 If you’d rather have a chunky soup, skip this step (I like it mostly pureed with some chunks in there). Return soup to medium-high heat and cook until thickened to your desired consistency (how thick do you like your soup?). Taste for seasoning.